Last week my doorbell rang. It was the mailman. He had a postage-due package from my new healthcare provider. I asked him why this particular package required $3.17 to receive. He showed me the metered stamp. It was a third class document, and third class cannot be forwarded to my new address. Hymmph, my healthcare provider considers his detailed book of benefits as third class, I’m in trouble. The postage due was a benefit I never expected because I met a very interesting man. His name is Henry. Henry asked if I had read his letter to the editor published in last weeks free newspaper. I had not, in fact, I did not receive the paper. Before Henry left to continue delivering mail to his customer’s I learned a lot about him, his political views, his religion, and his family. “Where will you go,” I asked. Talk about going full circle, Henry moved from Guatemala to have a happier life, which he found in America, and will return to the life he didn’t like in Guatemala just to get away from America turning socialist. 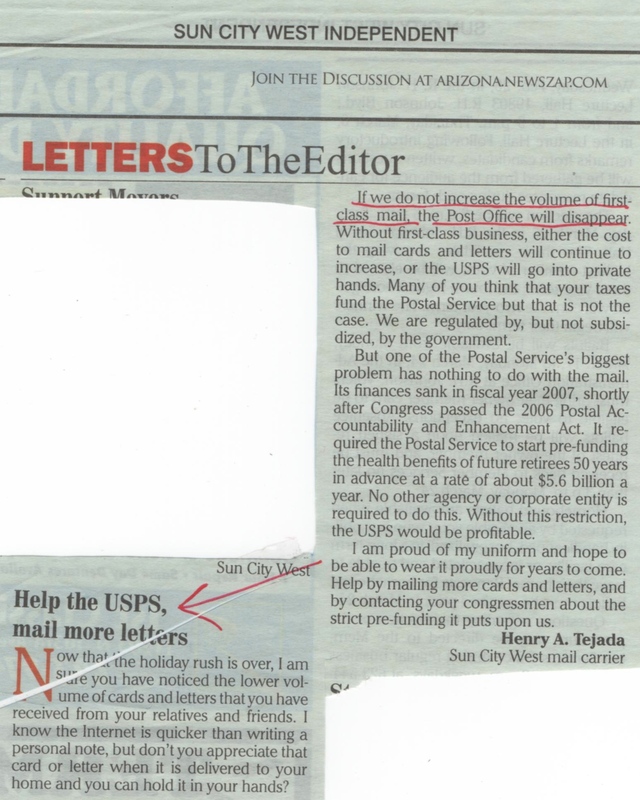 He is right, it doesn’t make sense to pass a law to make the USPS behave one way when every agency of government rides on the tax-payer without providing any service. Henry’s complete letter is below.